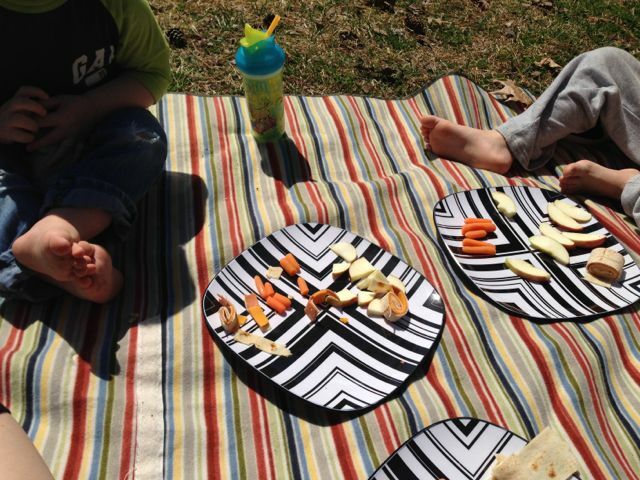 When we got home, we had our first picnic lunch of the season in the front yard. 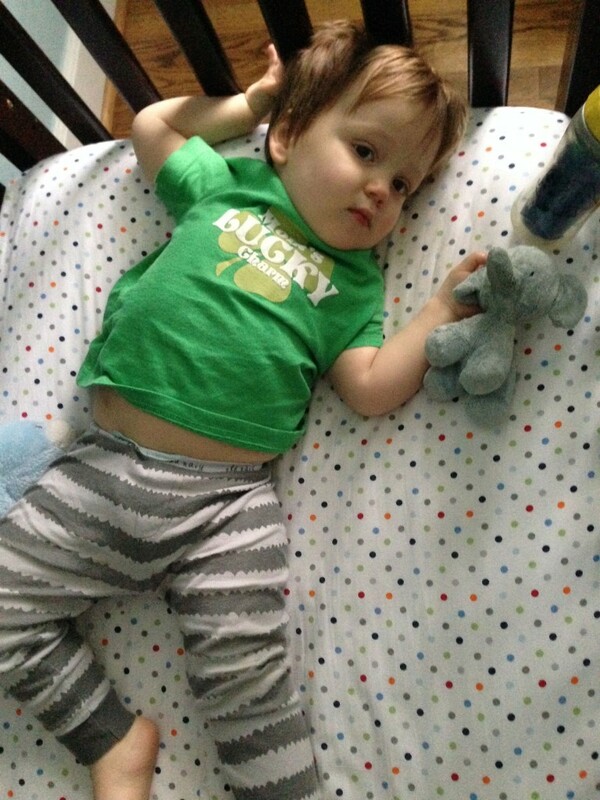 I really need to take a shower before Rory wakes up from his nap. But I wanted to do a quick round-up of the week before it gets away from me. I haven’t been able to write as much as I wanted this week. Rory got sent home sick from school on Monday. It’s a story in itself (which I started to write and will hopefully get back to), but the good news is he was back to his old eating, screaming, climbing, falling and screaming some more self by the end of the day. Pat thinks Rory came out of his lethargic, feverish state with new skills and renewed determination to conquer the world. And from Rory insisting on wearing a vest over his fleece pajamas at breakfast to his determination to fetch the paper from the driveway, walk down the stairs by himself and eat every tube of toothpaste in the house, I tend to agree. Noah has taken bedtime protests and excuses to a whole new level. That means the precious evening hours I usually use to write have been spent investigating claims of monsters in Noah’s closet, inventing ways he could help himself fall asleep, and reminding him for the 20th time that he is perfectly capable of using the bathroom by himself, if indeed he actually needs to use it. We’ve come up with a new “reward system” that has worked well for the last two nights. I’ll share it with you if it actually lasts through the weekend. I’m back on a home decorating tear, by which I mean I spend way too much time dragging Rory to Target and HomeGoods and taking pictures of everything I want and then coming home and holding up my iPhone in the room where a particular item might go and deciding it won’t work after all. That, and buying some new throw pillows. Okay, MANY new throw pillows. 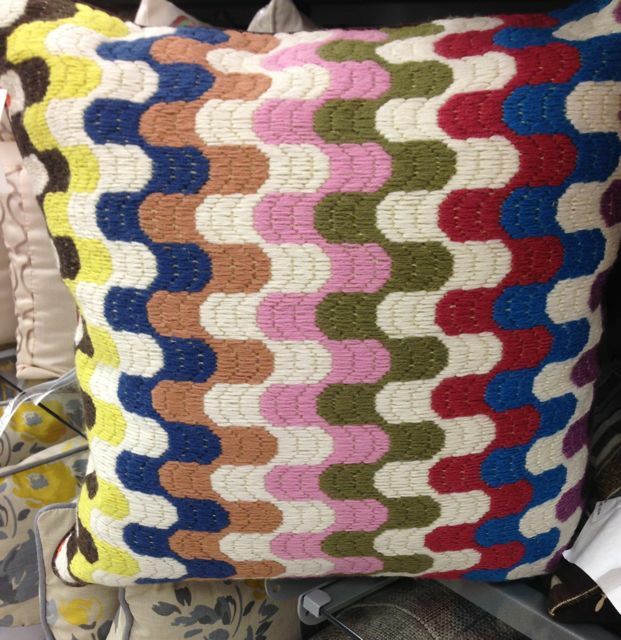 Possibly my favorite throw pillow ever. I have to resign myself to visiting it at T.J. Maxx and carrying its picture around in my phone, because it’s $60, and this homie don’t pay that. My friend Allison tried to get me into Pinterest a few years ago when she was helping me decorate Noah’s “big boy” room. She (and I) learned two things during that time: I’m too cheap for her excellent decorating taste, and Pinterest gives me panic attacks. But lately I’ve started to see the value of Pinterest as a virtual mood board/recipe binder/idea generator. So I’m back. And while I’m glad to have a place to find, share and store, say, recipe ideas, it can also be a little dangerous. Because, you know, a girl can only lust over so many elegantly photographed kitchens until she starts feeling not so thrilled about her own. Ditto whimsical spring outfits, Easter crafts, bikini bodies and children who actually sit still for photo shoots. 5) I have something cooking for next week. Not knowing me well enough to realize that I make offhand statements like this all the time without actually intending to follow through (see: this weekend’s Merge Records 25k, which I posted about on Facebook, but Pat – not I – is actually running), Allison created a whole plan for us and two other bloggers (Allie at The Latchkey Mom, Holly at Desert Momma) to hold our own Clean Eating Challenge. She was so enthusiastic and organized, I couldn’t bring myself to back out. Seriously, nothing would get done without people like her in the world. So next week, I’m getting clean. I guess it’s good I got all my decadent pancake and ooey gooey cookie posts out of the way this week. We kick of Sunday, and will be posting all next week about it. 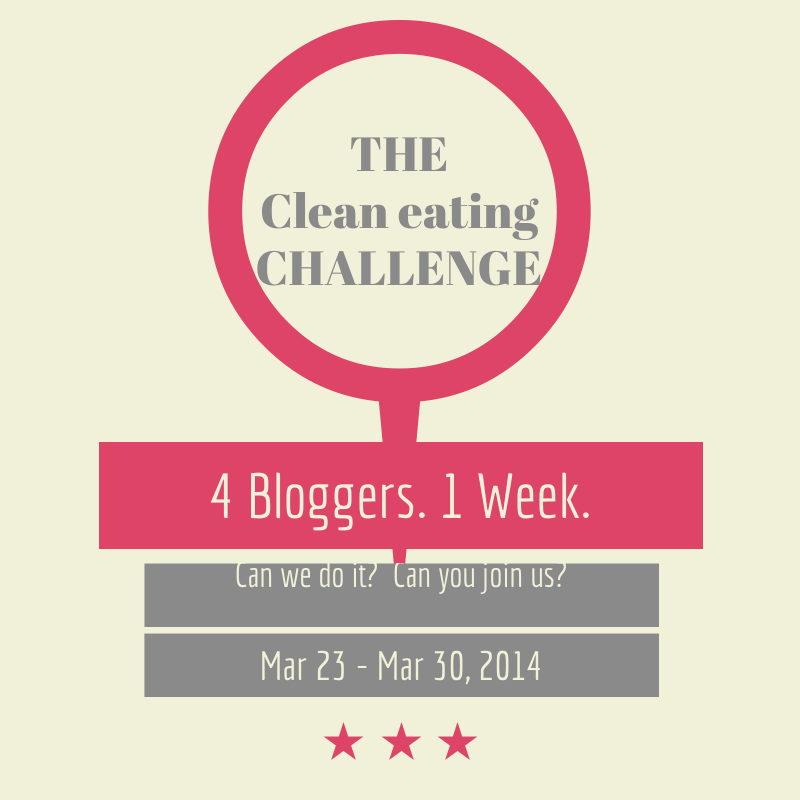 If you’re looking to do a little spring cleaning for your eating habits, you should join us! Guys, there’s a logo. I am joining with some pretty professional company here. And they might just regret including me in it by the end of the week. And…Rory’s awake. I guess I missed my shower for the day. But hey, that’s what the weekend is for, right?